I’ll be glad to see the back of Burton Albion. I have absolutely nothing against them apart from the fact they seem to have some sort of physiological hold over Blues. And when Lloyd Dyer scored to give them a thoroughly undeserved lead, it seemed as if Burton syndrome was about to strike once again. The fact Blues weren’t ahead at the interval was a travesty in itself. After having a Jeremie Boga goal wrongly, and so completely wrongly, ruled out for offside was a kick in the teeth. But missing several clear cut chances was the real reason for failing to win this encounter. 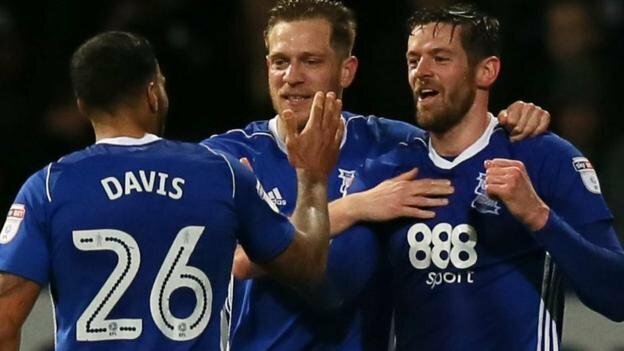 Lukas Jutkiewicz could have been toasting a hat-trick by half time. Blues really should have been cruising. Of course, missing so many chances will always come back to haunt Blues. Dyer’s thunderous effort early in the second half gave The Brewers the initiative. From then on, it was an onslaught. Jota hit the post, David Davis hit the bar, Stephen Bywater made a couple of fine saves and Blues wasted several good openings. It was all becoming a bit hectic. The lack of attacking options on the bench was felt when Cheikh Ndoye was introduced as an auxiliary striker to add height and presence to Blues’ forthcoming bombardment. With Jota pulling the strings, Garry Monk’s men always had a chance. They kept knocking on the door. Eventually the pressure paid off. Boga’s cross was headed home by Jutkiewicz three minutes from time. It was the least Blues deserved in a game they dominated. The late equaliser could be a massive goal in the battle to beat the drop. Looking on the bright side, at least we outplayed them, even if we didn’t get the three points we deserved. Usually we have an absolute nightmare against Burton, so more respect to GM for another improvement. 10 points from the last 4 games is a very good return so I’m not disappointed with that in view. Have to agree, I also will be glad when we don’t have to play them; and that point could very well prove precious in a months time. Rob……. the website is definitely much better with the latest upgrades.